Europe positively abounds with centres of artistic creativity that have been steeped in both ancient and modern artistic splendour and renown, and almost everyone can list at least a few of the big ones - Paris, London, Amsterdam, Rome, Barcelona, Berlin - but these cities are also among the most travelled in Europe, and probably in the world. So what about the smaller names? The less-travelled (even if only slightly) path? Today we're going to look at one of the true jewels of Italy and the art world: Florence. 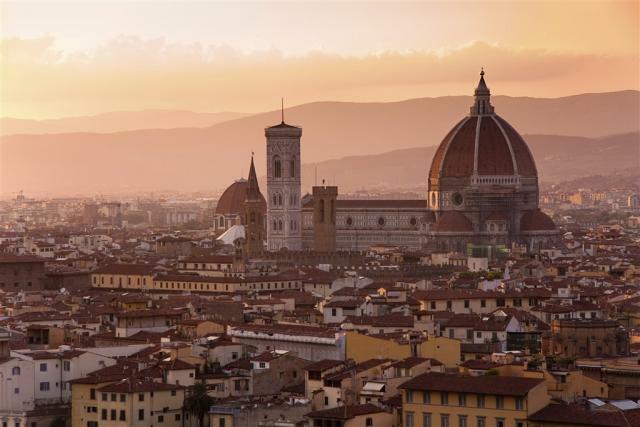 Firenze, as it is known in Italian, is often called the birthplace of the Renaissance, and rightly so. It was hugely influential in the development of Italian artistic styles, and boasts some of the most well-known Italian artists of antiquity: Michelangelo, Donatello, Giotto, Botticelli and Leonardo da Vinci (among many, many others). As a result, a huge number of their works are hosted in galleries throughout Florence, of which there is an absolute profusion. The Galleria degli Uffizi (Uffizi Gallery, in English) is arguably the paramount gallery for Renaissance art in all of Italy; the Bargello Museum is one of the oldest still standing, established in 1865, though the building that houses it dates back to the 13th century; and the Galleria dell'Accademia, which is home to the world-famous "David" sculpture by Michelangelo, which it's not touring the world. But the old masters aren't all there is the Florentine art scene. Just in the historic centre alone there are over forty galleries which feature contemporary artists, as the rich legacy of artistic tradition beckons young and old aspiring artists, and inspires them to incredible heights. The interplay between old and new, traditional and contemporary is visible at every step, but no more so than in the Marino Marini Museum, which is housed in the former Church of St. Pancrazio, which has been deconsecrated. Just down the street can be found the Alinari National Museum of Photography, a mere 5 minutes away, which truly highlights the differences between traditional artistic modes and the modern, for there are few more modern art forms than photography. Regardless of which direction your artistic taste leans - or best of all, if you prefer a blend of modern and Renaissance - Florence will help you scratch that artistic itch, without being mobbed by the sorts of crowds you so often find in the famous larger European cities.